They say that hard work and dedication are the key to success, which young North-Eastern producer Denney realised in 2012 when his first track 'Ultraviolet' was signed by the Hot Creations camp, leading to huge international success. He was soon named 'Future Hero' in Mixmag and the track held a strong position at Number 1 in the best selling vinyl chart on Juno and gained him support from heavy-weights Sasha, Damian Lazarus, Seth Troxler, MANDY, Pete Tong and many more. 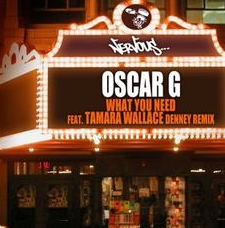 Gearing up for its Beatport release on New York based record label Nervous, Denney's remix of Oscar G's 'What You Need' Feat. Tamara Wallace is a deep, driving house record that is as infectious as it is a possible big dancefloor track. Having seen early support from the likes of Annie Mac, Danny Howard, Monki and Target at Radio 1 / 1xtra, Coco Cole/Clubbers Guide at Capital Xtra, Subsoul / Steve Smart at Kiss FM, the track is looks set to be huge.